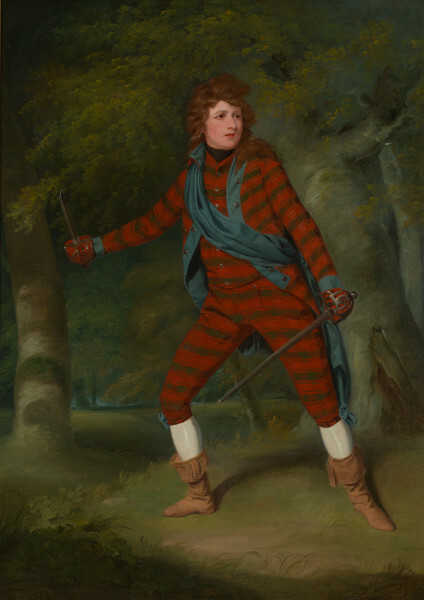 Like Henry Erskine Johnston in G0332, Mrs Powell is shown at the climax of the play in Act V, staggering onto the stage "with a sword in each hand." Young Norval dies in front of his mother after being mortally wounded by Lord Randolph. Mrs Powell wears brown boots, white stockings, a tight-fitting red suit with horizontal green stripes and blue facings, a blue sash, and a plain dark green stock. Mrs Powell played Young Norval for her benefit at Drury Lane on 2 May 1795 and on several subsequent occasions.